This is another fine product from the DA Bomb brand name. 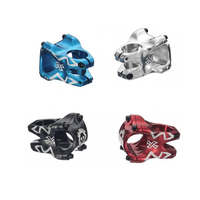 The DA Bomb KING 50mm 2 in 1 Design Alloy Stem has been made from 6061-T6 Alloy, that has been skillfully CNC machined to produce this fine looking product. Having the King on your bike is really cool and fun, with Anodized colours, the stem looks brighter and not so old school. The new 2 in 1 design is compatible with both 31.8 or 35mm handlebar bore diameters options, as it has a removable spacer fitted. The KING 50mm 2 in 1 Design Alloy Stem is both extremely strong and at only 157g very lightweight. It is available in three cool colour options either Black, Blue or Green.